The Past in Colour: Ose! I thought you said "'oes!" The unidentified steamer seems to be leaving, but then again it could be arriving - its difficult to say! To be honest the buillding could't be more MacBrayneified if they tried! The MacBraynes Road services Bedford TK has a load of what looks like bagged gravel. A gent in a kilt views the departing ship which is heading to (or is arriving from) Oban and generally it is a scene of no great significance, but one that occurred numerous times per day throughout the Western Isles and interesting fifty years later simply because of its ordinariness. 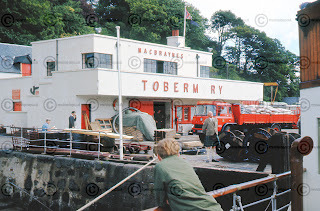 The pier today no longer services the ferry, which now runs from Craignure. However, the pier offices still survive today with the upper floor now a seafood cafe, "Cafe Fish", that by all accounts is rather good and the pier is still used by shellfish boats. There has been no trace found, despite numerous searches over the years of the rumoured Spanish Gallleon wrecked in Tobermory Bay after fleeing from the English in 1588, but it IS a good story nevertheless! The title of this entry is taken (with due acknowledgment) from the two Ronnies Four Candles sketch, as it seemed entirely appropriate!! Apologies for any readers not from the UK as this will make NO sense whatsoever! !